ESR focuses on solving e-waste problems by developing electronics recycling programs to fit the requirements of each one of our valued clients. 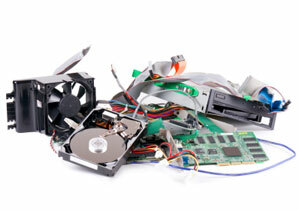 We completely recycle all types of electronics equipment and material, including all computers (mainframes, monitors, CPUs), printers, fax machines, modems, bridges, hubs, copy machines, consumer electronics (radios, CD players, DVD players, clocks, calculators, telephones, cellular phones), components and other various types of material. Each piece of equipment and/or material is tracked, disassembled by hand, carefully separated and eventually utilized as feedstock for various raw material extraction processes (including smelting and refining). Disposal of electronic equipment such as older computers, printers, copiers, fax machines, etc., is becoming a larger problem every day. It is increasingly common that you may have to let someone properly dispose of many types of older electronic equipment such as older computers, printers, copiers, fax machines, etc., is becoming a larger problem every day. Many states have passed laws that prohibit the dumping of items such as monitors, computers and printers and are requiring that these items be properly disposed of. ESR Electronics, Inc. is a certified ISO9001 company (ISO9001:2000 registration data and certification number available). ESR Electronics consistently does extended research and strict analysis of operations as required for continuous improvement of its Quality Management System, to ensure we maintain our leadership status, from beginning to end of the recycling process. ESR Electronics, Inc. Copyright 2009 – All rights reserved.